Most attendees will leave a conference with a handful of new contacts, some swag, a few empty promises and the latest flu or cold that’s going around. A lucky few will also take home a solution to a pressing problem, as massAV Director of Operations Aaron Raymond did at one InfoComm after he approached the FiberPlex stand to discuss options for easily getting 3G video signals and network control from a ground control center to multiple, redundant projectors mounted on trusses. The use of fiber optic communications was already a given for the event production company in Tewksbury, Massachusetts, massAV is a longtime user of FiberPlex’s fiber technology, including the WDM optical multiplexer to multiplex onto existing fiber for transporting video, audio, lighting and control feeds. Standardized on quad fiber for most of its systems, the company now needed an electronics box for terminating the strands of fiber cable that ran from a central control to the bank of projectors mounted high overhead on trusses. “We’d hand built something in the past, but these were four to six space racks that we couldn’t easily strap onto trusses. I talked to Kyle and Buddy (at FiberPlex) during InfoComm, and they thought they could modify one of their rackmount units to work,” says Raymond. FiberPlex was able to come up with a solution based on its popular 6-position TDP rack unit. 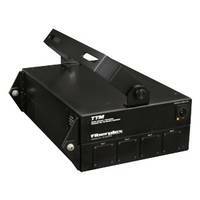 The result is TTM, which provides connection, power and cable management for up to 6 front-facing TD modules in a compact, rugged truss mountable frame. TD modules each house interchangable SFP/SFP+ modules for interfacing to a variety of gear and environments, including converting between media formats SD-SDI, HD-SDI, 3G-SDI, and 6G-SDI and for HDMI/DVI, 10/100/1G Ethernet and MADI, as well as full duplex and BiDi optical. massAV has standardized on fiber communications for most of its large venue systems and collaborated with FiberPlex reps in the past. As a result, the production company has been able to replace 2,000 pounds of copper cabling with a 25-pound spool of fiber optics for large events, a savings that is realized by its corporate and other live event customers in reduced labor, setup time and transportation costs to truck in and set up copper. Look for FiberPlex at future conferences. PYROCOAT® K Optical Fiber withstands short excursions at high temperatures.